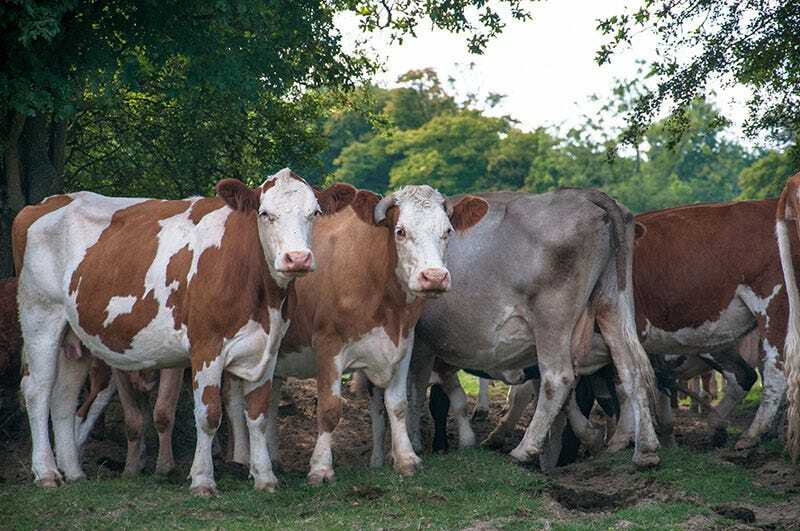 A sawmill may not be the first thing you expect to see on a beef cattle and sheep farm, especially when the mill, sited next to the farmhouse, houses the largest Wood-Mizer horizontal bandsaw in Europe. 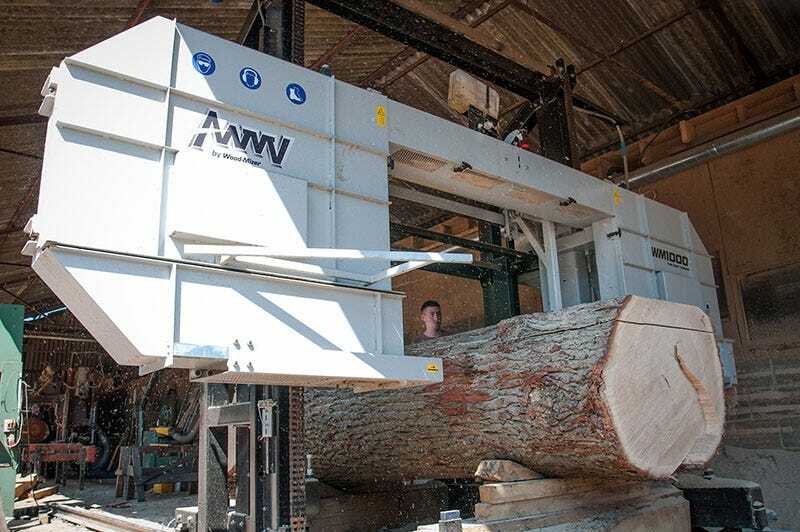 The WM1000, which can cut logs up to 1.7m diameter in the centre, was originally designed to meet demand for a cost-effective machine to saw tropical hardwood logs in Asia and Africa, but at Copford Farm Sawmill in Sussex it is proving its worth cutting large diameter oak prized for top grade joinery as well as quarter-sawn material for furniture. Demand from builders, joinery companies and furniture makers for the quality English sawn oak produced by the sawmill has ensured steady growth in this side of the business. The local area has a tradition of oak-framed houses and provides an important market, but Copford’s expertise in oak has attracted customers from far afield as well. Recent high profile commissions include timber for the 2012 Olympics cross-country horse trials, a narrowboat that was part of the Jubilee flotilla, rebuilding a waterwheel in a Welsh village for a TV programme, and several archaeological projects in east Sussex. The mill also cuts FSC certified oak for customers who require this, including local councils, with every board tagged and stored separately for chain of custody control. Alex Gingell, whose family have been farming for generations, has reared cattle and sheep on his 120-acre Copford Farm since 1977. 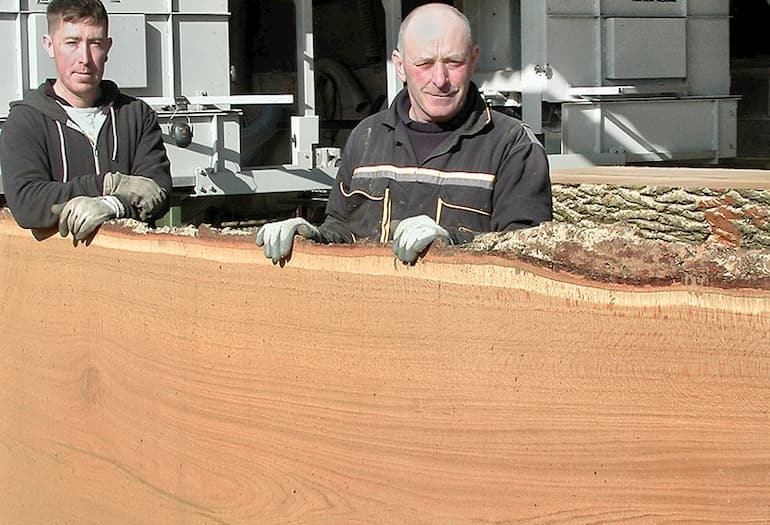 The move into sawmilling began following the 1987 hurricane that battered southern England. Collecting the plentiful windblow logs and hiring a local mobile sawmiller to cut them, Alex started making bespoke oak gates for sale to local customers. 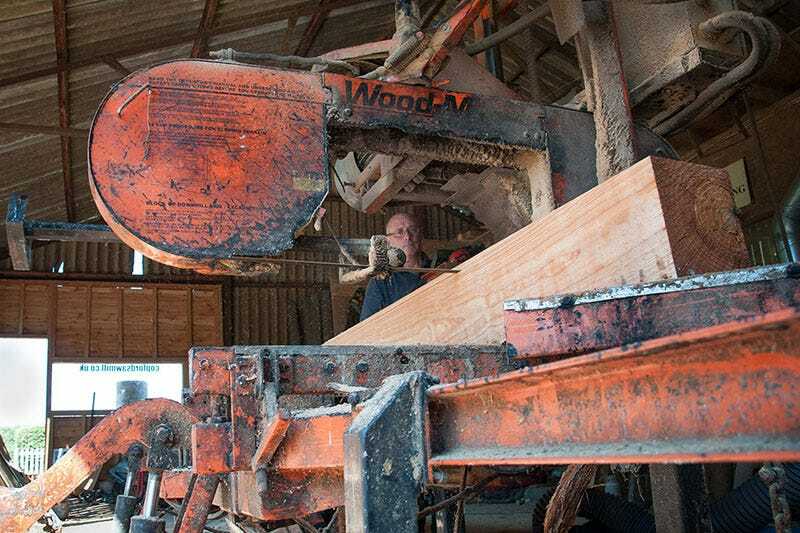 “Over the next three years this business grew to become a useful supplement to farm income, and in 1990 I decided to buy my own LT40 mobile sawmill from Wood-Mizer”, said Alex. “Demand for gates continued to increase, and then small builders started to ask for oak beams, leading to further expansion”. In the mid-90s the LT40 mobile was replaced with a newer model to benefit from advances in the design and technology of the machine, and in 2004 the machine was replaced again, this time with a static LT40. “I introduced some changes to our methods of farming to streamline the system and give more time for running the sawmill, which was getting busier and busier, but it was becoming more difficult to have time to go out with the mobile saw so I bought the static machine and set up the sawmill on the farm”, said Alex, whose son Harry had now returned from service in the Army and joined his father working in the mill. 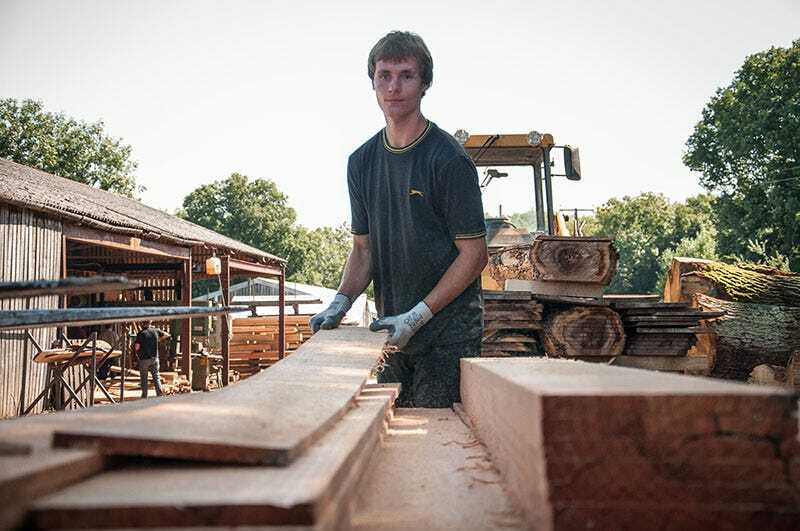 “We specialise in bespoke products for the higher end of the market and buy from local estates – mainly English oak but with a small amount of cedar and larch – choosing quality logs that are best suited for the intended end-products of our customers. Another issue with mobile milling was that we were cutting the customers’ logs and they told us what they wanted out of it – but sometimes the logs were just not suitable for their desired end-product. Along with installing the static LT40 we started buying-in logs and now cut only our own logs, so we can select the best one to meet a customer’s requirements for sawn product”. Smaller diameter straight logs are easily cut on the LT40, but any with wide flared butts have to have the butts removed with a chainsaw, and large diameter logs have to be cut in half, also with a chainsaw. The mill holds around 2,500 cubic feet of logs at any one time, and a fair number of these are of large diameter. Bigger logs tend to be better quality and are more expensive, making it important to achieve maximum yield of sawn material. There was a clear need for a larger capacity sawmill, but despite several years of research into wide and narrow band options, finding the right one for Copford’s needs proved problematic. Then, in mid-2011, Wood- Mizer launched its WM1000. 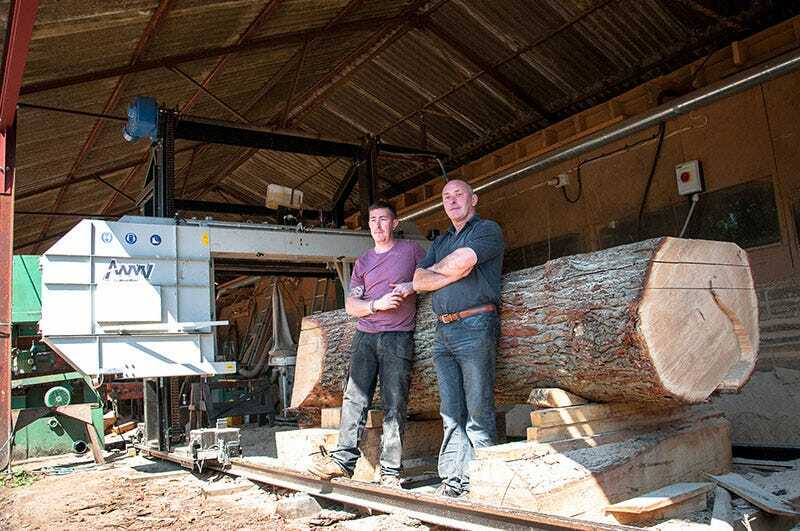 “I read about it in the UK trade press and contacted David Biggs at Wood-Mizer UK”, said Alex. “The fact that it is a horizontal bandsaw was a definite plus point, since it could be installed easily and cheaply on a flat surface rather than requiring a pit like a vertical bandsaw, and could therefore be moved without problem if we rearrange the mill layout in the future. 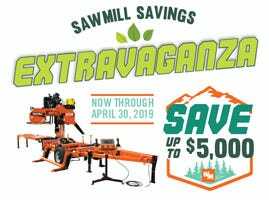 “However, the main benefit was that it would run with 2in/50mm narrow bandsaw blades that could be maintained using the Wood-Mizer sharpening and setting machines that had already been purchased for the LT40 blades. 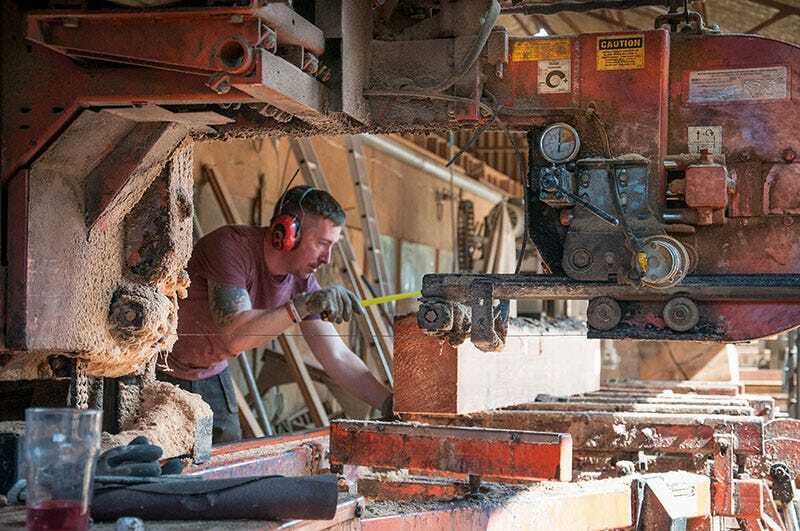 “There was no WM1000 installed anywhere in Europe to look at, but there are good YouTube videos of the sawmill in action, so we watched those, read the technical information, and together with discussions with David Biggs that was enough for me to be confident that it was the right machine for us”. 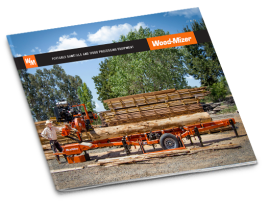 The WM1000 is the largest sawmill to be manufactured by Wood-Mizer to date. It combines robust, durable construction with easy installation and simple operation, and takes 50mm or 75mm width narrow band blades running on 1m diameter wheels. Despite its large size, therefore, it retains the key benefits of Wood-Mizer's world-leading thin kerf technology – reduced capital cost, energy savings through lower power requirements, and maximum recovery of valuable wood from each log because the blades cut less sawdust and more boards. Hydraulic blade tensioning ensures accurate, straight cutting with a good surface finish, whether the user is halving or quartering a log or producing slabs for further processing, or using the Setworks control to automate production of finished boards of consistent thickness. The headrig is a twin-rail design, with four driven wheels running along 'I-beam' tracks. The mill is also available with a raised bed with advanced hydraulics for loading, turning and adjusting the log, but for specialist operations like Copford, cutting relatively small volumes of larger stock, the higher cost of this level of automation is difficult to justify and the manual version is a better proposition. The control panel is mounted on the head and the operator rides on a platform during cutting operations. Harry Gingell, who runs the WM1000, is a TRADA-trained visual grader for hardwood and the fact that the platform moves with the head means that he is able to closely observe the cutting process. 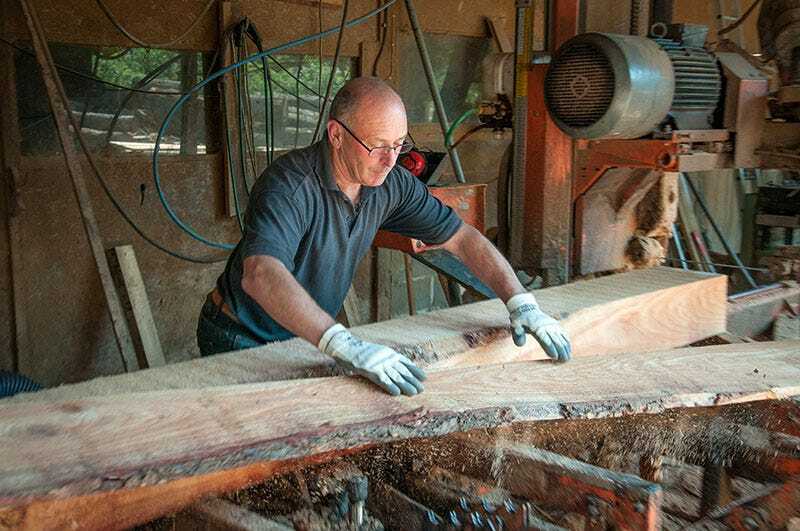 “I’m reading the timber all the time, with each cut, and assessing it for grade and purpose”, said Harry. “It’s a huge sawmill but easy to operate. Cutting slabs which are then resawn on the LT40 is a lot quicker than squaring logs and then resawing on the LT40 alone. For example, to produce 5in x 4in beams we now cut 4in thick slabs on the WM1000 and then turn them 90 degrees on the LT40 and cut every five inches. “In addition to being faster we are getting much higher yield from bigger logs – trimming them with a chainsaw to fit on the LT40 meant a lot of waste”. As well as controls for vertical, forward and backward movement of the head, the WM1000 comes as standard with Wood-Mizer's Setworks system. This improves productivity by allowing the operator to pre-set the required board thickness, after which the head is automatically moved to the correct position for each pass, ensuring precise and consistent control. Variable forward and reverse speed allows the operator to adjust cutting speed to suit the size and species being cut - and to use 'full speed' for the return journey for maximum production efficiency. “Accuracy is spot on and the surface finish is excellent”, said Harry. “We have had very good feedback from customers”. As the only sawmill manufacturer that also makes its own blades, Wood-Mizer has invested heavily in research and development and also in blade production lines to expand its supply capacity of blades that provide optimum performance on its own and other makes of bandsaw. The WM1000 takes blades of nearly 10m in length, and an additional feature of the head is that the hydraulic blade tensioning system allows the distance between the bandwheels to be adjusted by approximately 200mm. This amount of movement means that the blade can continue to be used even if it is repaired by shortening and re-welding. “In-house blade maintenance is very important”, said Alex. “Using outside saw doctors risks problems with delivery times and you have to keep more blades in stock. The Wood-Mizer blade maintenance machines are easy to use and ensure that the blades are always correctly sharpened and set. We use the 50mm DoubleHard blades and have had no problems at all”. 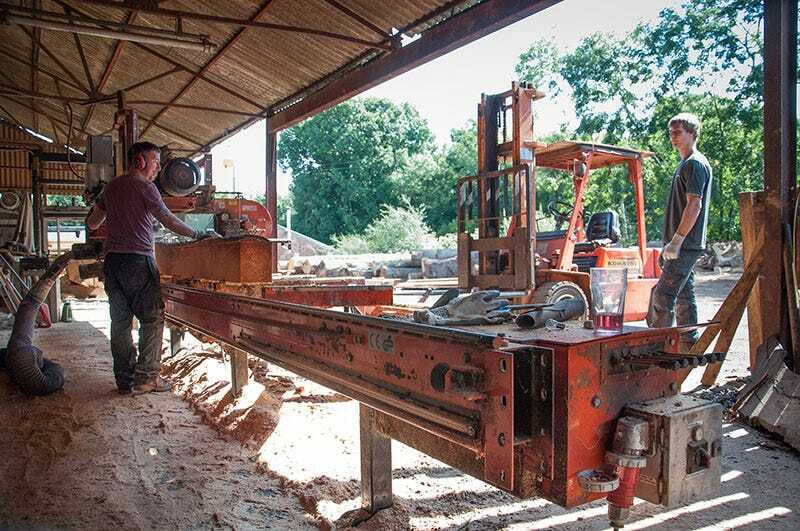 Copford Farm Sawmill has deliberately set out its stall as a bespoke oak specialist, serving higher end and therefore less price- conscious and competitive markets. The expertise of the company has become known far and wide and demand is strong and increasing – and this is likely to be given a further boost now that the mill can handle larger logs and ensure high yield. “The business has changed over the years and grown significantly”, said Alex Gingell. “Our experience of the LT40s and of Wood-Mizer’s manufacturing and service capability has been positive and it is good to stick with the company for the WM1000, which takes us to a new level of capability in the sawmill”.